SafeMotos is a Rwandan initiative developed in response to worrying road death statistics across Africa. By 2030, this highly avoidable cause is forecast to be the number one killer across the continent, and in 2014 road deaths killed more people than the Ebola outbreak. In their research, company founders Nash and Peter found that over 75% of Rwandans would be willing to pay more for a safer ride on a motorcycle taxi. They set about creating an Uber-inspired app to connect customers with safer, peer-reviewed drivers. Drivers registered with SafeMotos have to pass the company’s entry requirements. On the road, the drivers have a similar app installed that provides gyroscopic, accelerometer and GPS data back to the company – giving a holistic overview of the motorcycle driver’s habits and driving style. SafeMotos rates the driver from ‘normal’ to ‘very safe’, giving the customer the data and empowering them to make a choice right for them. Free to use, SafeMotos is paid for by taking a small cut from payments made via the app. Passengers can opt to pay cash as well. 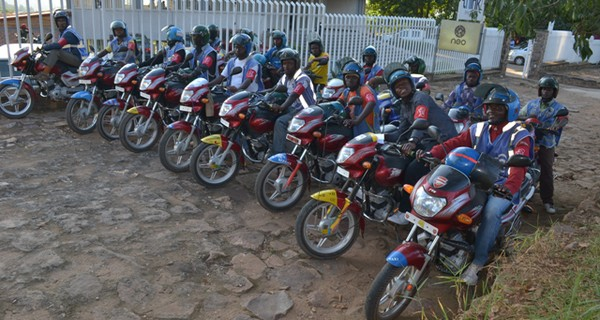 The service launched in June 2015, and SafeMotos is seeking to sign up as many of Rwanda’s motorcycle taxis as possible – in the capital Kigali there are 20,000 such vehicles. After Rwanda may come entry into other African countries and cities, addressing a market that the World Bank confirms is only set to grow. SafeMotos is supported in its early stages by Irish start-up accelerator AXLR8R, benefiting from a talented pool of developers, as well as global mentorship and investment opportunities. The app is currently available on the Google Play app store.